My Urban Child is a quality modern home décor store dedicated to providing you with modern children's bedroom furniture and baby furniture that is safe and sturdy as well as designed to be as amazing as the most inspiring art piece for your child's room. From cribs and modern crib bedding to changing tables and mini rocking chairs, they have everything to help you complete your baby's nursery in style and comfort. As your child grows, look for our totally cool playroom and bedroom furniture. 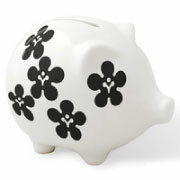 Keep reading to learn how you could enter to win a notNeutral black/white porcelain piggy bank from My Urban Child! notNeutral is the product design company affiliated with the award-winning Los Angeles based architecture and design firm Rios Clementi Hale Studios. Growing out of a close collaboration between these two companies, products are inspired by gardens, buildings are inspired by plates and patterns are inspired by urban plans. 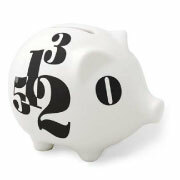 Porcelain piggy banks with only one hole, on top, will keep your change safe. 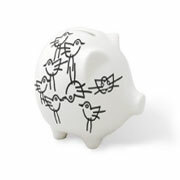 Available in three patterns (Pretty, Chick and Count) that coordinate with our surface graphics and t-shirts. Disclosure: I received no compensation for hosting this giveaway. The information presented here has been taken directly from the sponsor's site.